Narrated by the voice of a once-in-a-generation Twitter account @GuyInYourMFA: a handbook for the wannabe literary elite and those who laugh at them—all illustrated by a New Yorker cartoonist. Who better than that unjustifiably overconfident guy in your MFA to mansplain the most important (aka white male) writers of western literature? You can’t miss him: riding the L, writing furiously in his Moleskine notebook, or defying the wind by hand-rolling a cigarette outside a Williamsburg coffeeshop. He’s read Infinite Jest 9 1/2 times—have you? From Shakespeare’s greatest mystery (how could a working-class man without access to an MFA program be so prolific?) to the true meaning of Kafkaesque (you know you’ve made it when you have an adjective named for you) to an appropriately minimalist dissertation on Raymond Carver that segues effortlessly into a devastating critique of a New Yorker rejection letter (”serious believability issues”), this guide is at once profound and practical. Use a Venn diagram to test your knowledge of which Jonathan—Franzen, Lethem, or Safran Foer—hates Twitter and lives in Brooklyn. (Trick question: all 3!) Practice slyly responding to an invitation to discuss Bartleby the Scrivener with “I would prefer not to.” Sneer at chick-lit and drink Mojitos like Hemingway (not like middle-aged divorcées!). And as did Nabokov (originator of the emoticon), find the Pale Fire within. So instead of politely nodding next time you encounter said person at a housewarming party in Brooklyn, you can hand them this book and tell them to roll up their sleeves and cigarettes, and get to writing the next great American novel. 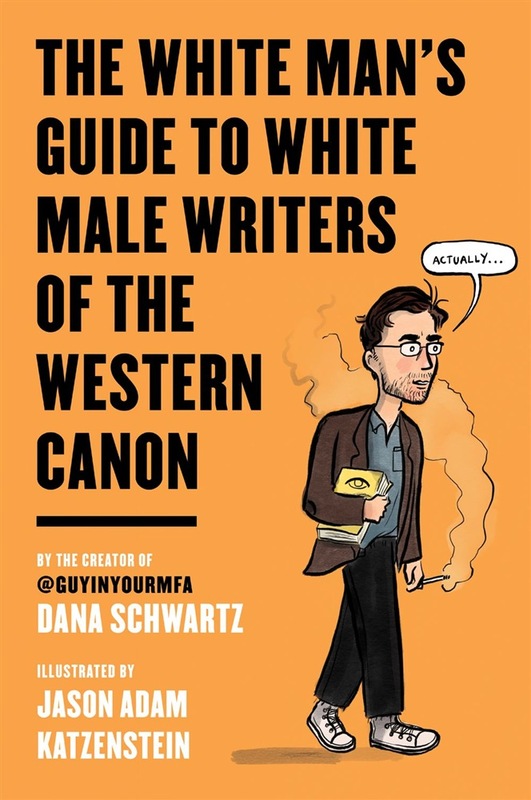 Acquista The White Man's Guide to White Male Writers of the Western Canon in Epub: dopo aver letto l’ebook The White Man's Guide to White Male Writers of the Western Canon di Jason Adam Katzenstein, Dana Schwartz ti invitiamo a lasciarci una Recensione qui sotto: sarà utile agli utenti che non abbiano ancora letto questo libro e che vogliano avere delle opinioni altrui. L’opinione su di un libro è molto soggettiva e per questo leggere eventuali recensioni negative non ci dovrà frenare dall’acquisto, anzi dovrà spingerci ad acquistare il libro in fretta per poter dire la nostra ed eventualmente smentire quanto commentato da altri, contribuendo ad arricchire più possibile i commenti e dare sempre più spunti di confronto al pubblico online.